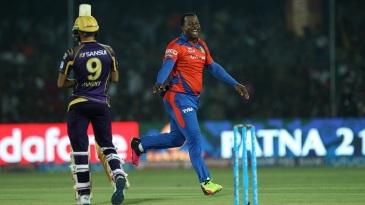 Dwayne Smith used a green Kanpur pitch as his ally to return figures of 4 for 8, setting up Gujarat Lions' six-wicket win against Kolkata Knight Riders. Lions restricted Knight Riders to 124, and then overhauled the target with 39 balls to spare. The win not only vaulted them to No. 2 on the points table, but also lifted their net run-rate from -0.747 to -0.479, intensifying the race for the playoffs. Knight Riders, sent in to bat, started solidly before Gautam Gambhir was involved in another run-out, in the fourth over. With Gambhir and Robin Uthappa stranded mid-pitch, Shadab Jakati, replacing Shivil Kaushik, fired an accurate throw at the striker's end after an acrobatic stop at midwicket.